Harold is 60. So is his purple crayon. For Crockett Johnson‘s 109th birthday (today! ), we’re celebrating Harold’s 60th birthday… with a few tributes from other artists. First, it’s graffiti artist URNewYork (2esae & Ski), as photographed by Michael Weinstein for C.J. Hughes’ “The East Village Embraces a Colorful Past” (New York Times, 9 Nov. 2015). 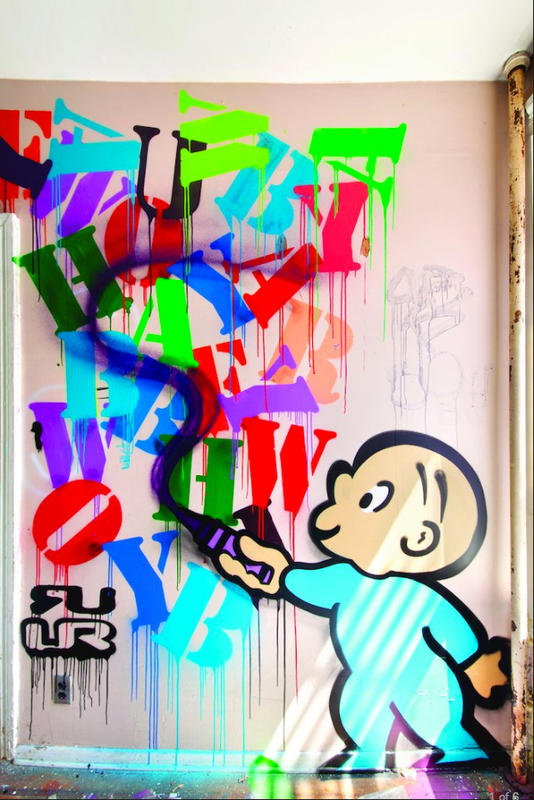 The art appeared in an abandoned property at 324 East Fourth Street, in the East Village. The developer decided to photograph the art before renovating the building. Harper Collins has invited artists to create their own tributes to Harold. 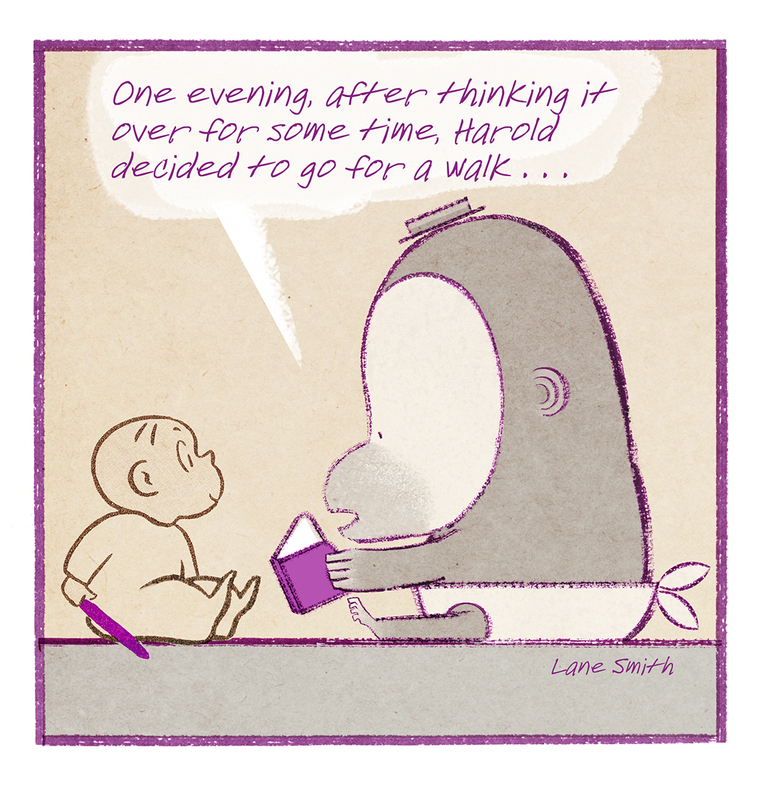 In this one, Lane Smith has his monkey from It’s a Little Book reading Harold and the Purple Crayon to Harold himself! An appropriately meta tribute to a book that itself reflects on the art of storytelling and picture-making. 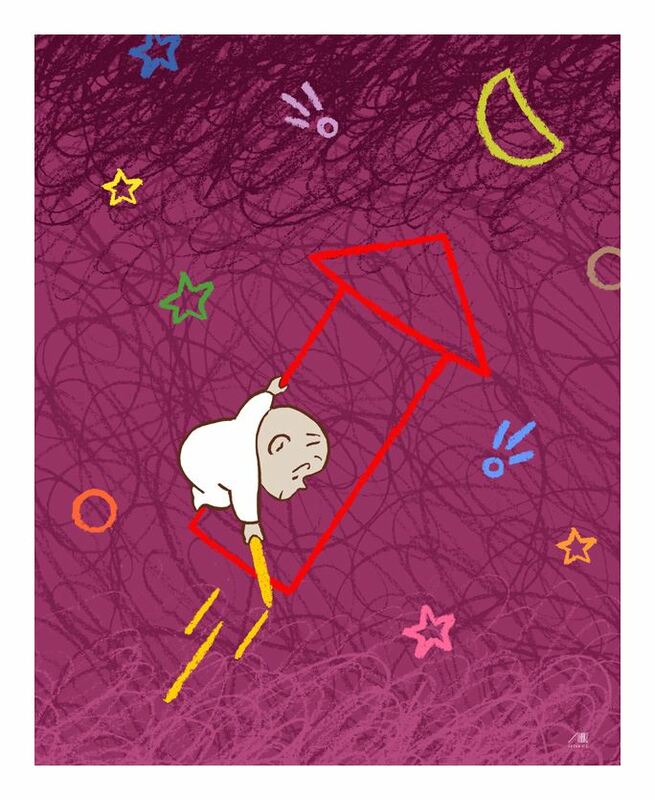 In another of the tributes solicited by Harper Collins, Bob Staake adds a touch of color to Harold’s Trip to the Sky. Dipping into the Nine Kinds of Pie archive for Karen Hallion’s Harold and the Purple TARDIS (April 2012). In another one from the archive, Madeline Stuart renders Harold in 3-D for a display window at L.A.’s Compas. Johnson’s book plays with perspective, as Harold uses his line to render some items in 2-D, and some in 3-D. So, I particularly like seeing Stuart’s 3-D rendition — viewed, appropriately, through a window. A Manifesto for Children’s Literature; or, Reading Harold as a Teen-Ager (21 Sept. 2015). An essay of mine in the current issue of The Iowa Review. The Archive of Childhood, Part 1: Crayons (27 Dec. 2014). A Very Special House (30 Sept. 2014). A visit to the house where Crockett Johnson wrote Harold and the Purple Crayon. 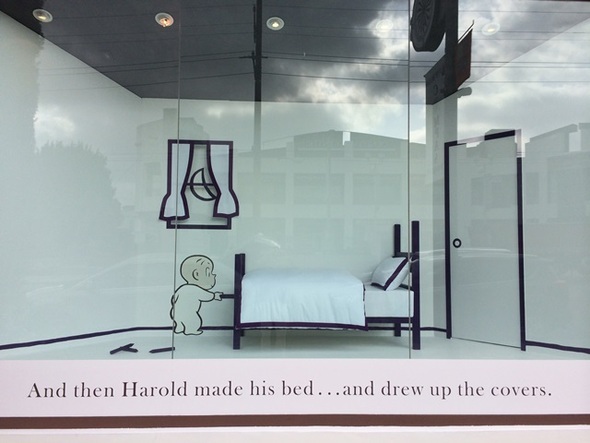 How Much Is That Harold in the Window? Harold at Compas, L.A. (10 May 2014). Full post for image reproduced above. Crockett Johnson and Ruth Krauss: Chris Ware’s cover (9 May 2012). Chris Ware’s cover to my biography is beautiful. 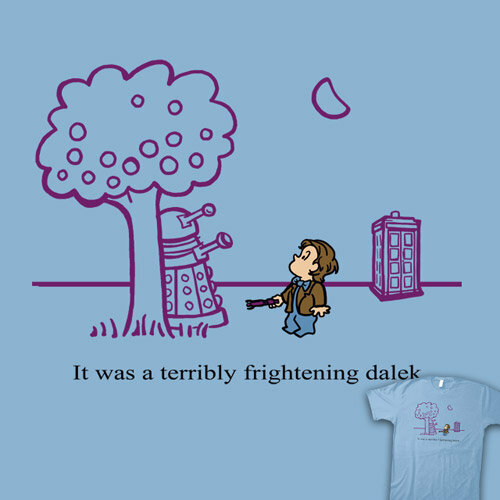 Harold and the Purple TARDIS (2 April 2012). Full post for image reproduced above. I’m celebrating too! This is the theme of my Family Night storytime this evening. I put a long sheet of butcher paper up in the hallway, which we will draw our own adventures on with purple crayons after we’re done reading. Belated thanks for your comment! Hope you & the children had an appropriately scribbly celebration!